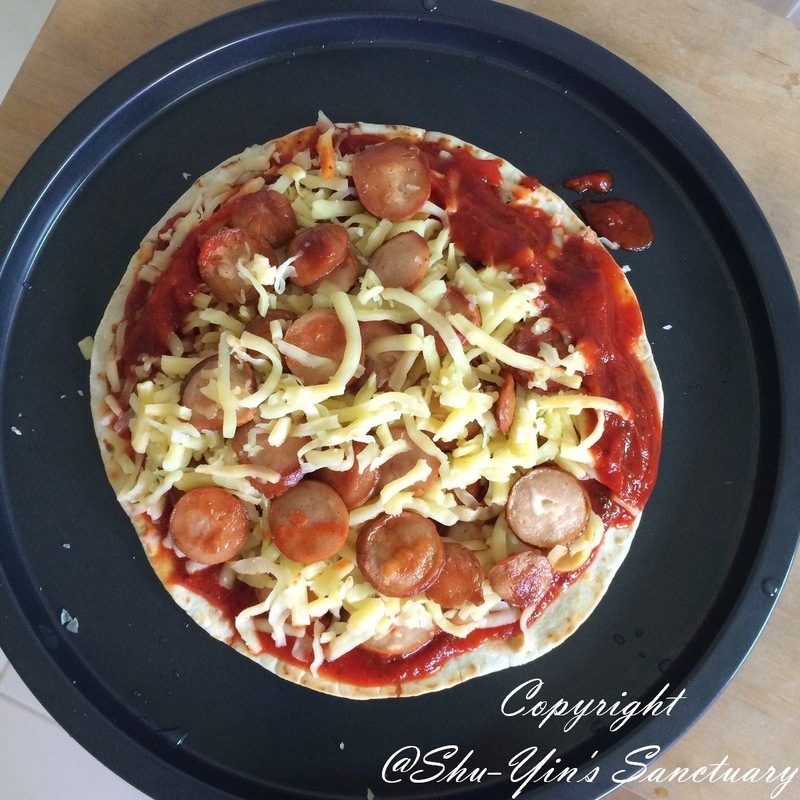 Shu-Yin's Sanctuary: Easy DIY Homemade Pizza! 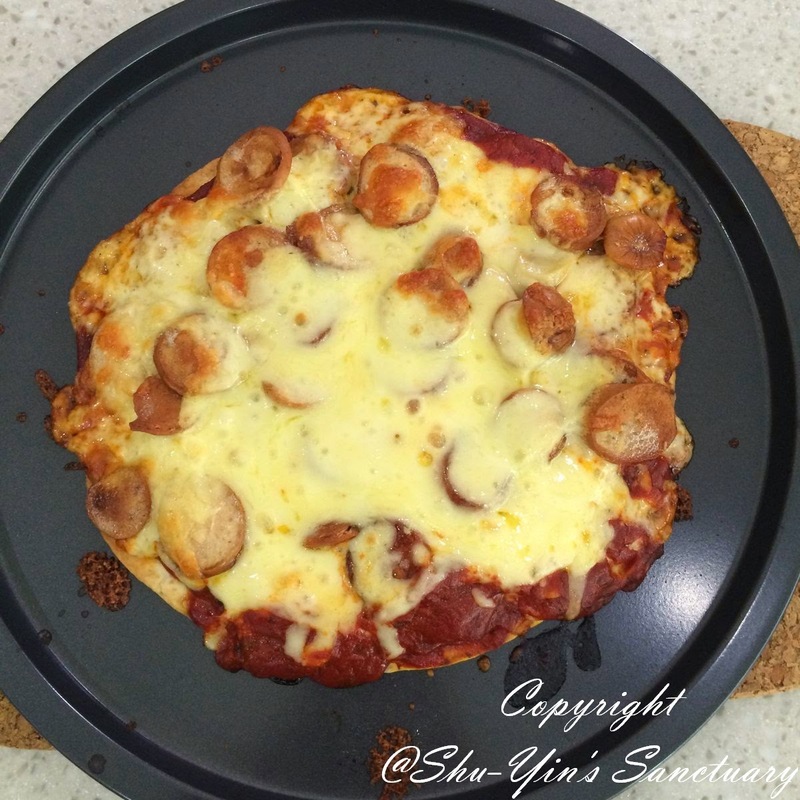 Today, Shern and I made pizza. 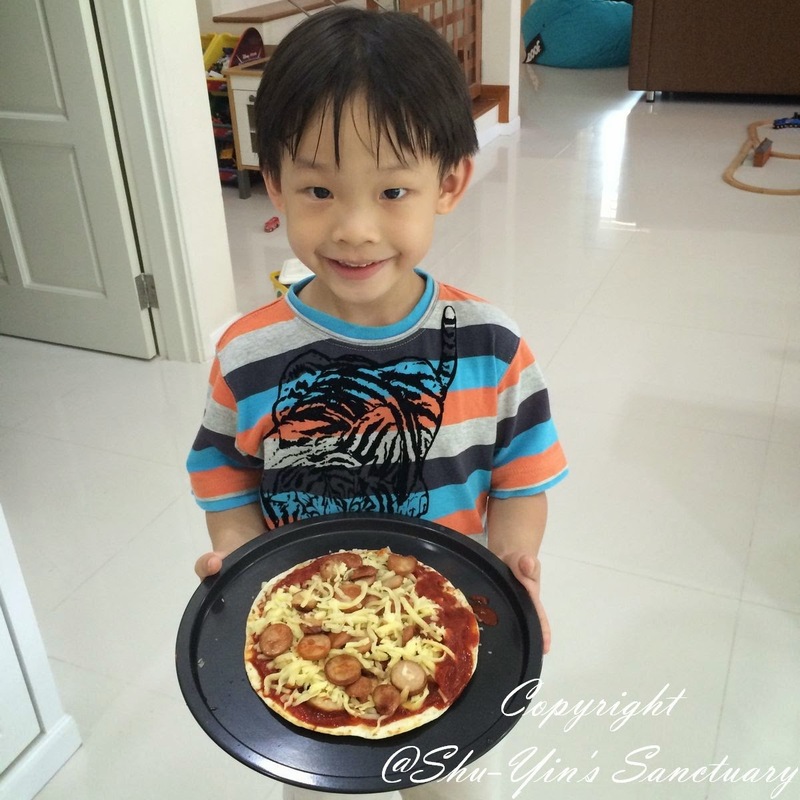 I would like to share with you all how easy it is to make some simple homemade pizza. 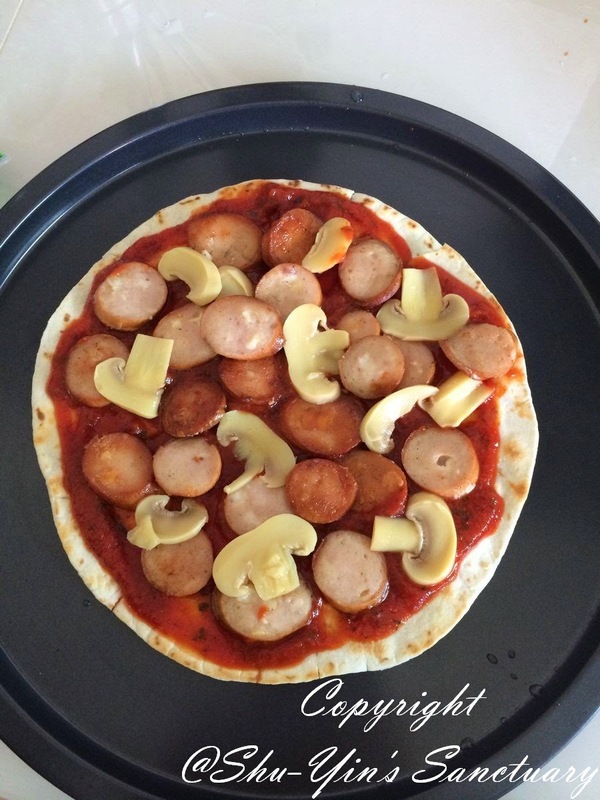 Firstly, we used a paratha as the pizza based. 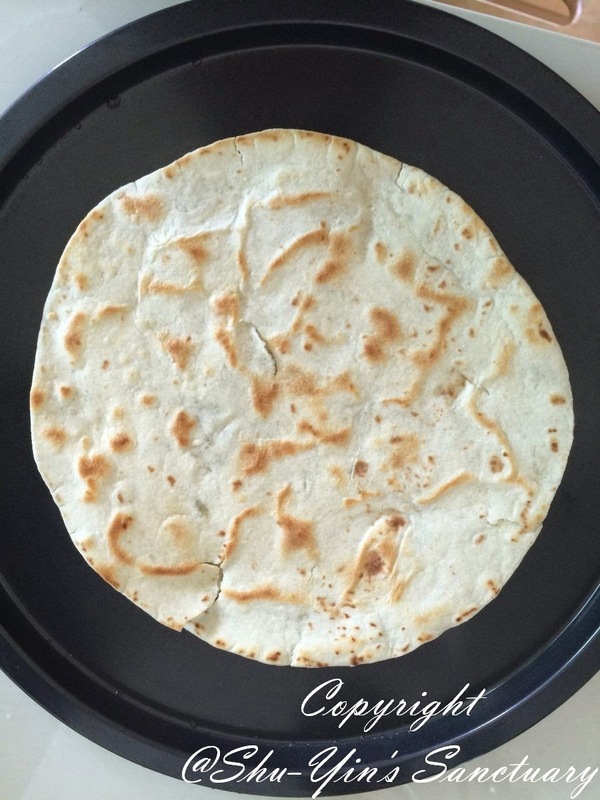 You know those store-bought paratha/wrap. 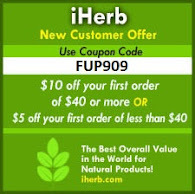 You can keep them frozen and just heat it up when you need them. I didn't heat it up because it would go into the oven later. Next, spread some tomato-based pasta sauce all over the paratha. If you don't have that, just use your normal ketchup. And if you are hardworking, make your own sauce by blending some squashed tomatoes and add in some garlic and basil and some salt. That's for the hardworking ones. Ok, then this is where Shern came in. Arrange the ingredients of your choice. Shern arranged some sliced sausages and button mushrooms. And I sneaked in some chopped brocolli to sneak in some greens into his diet. And then topped it with lotsa grated cheese. Cheese of any kind will do. We used cheddar and mozzarella. 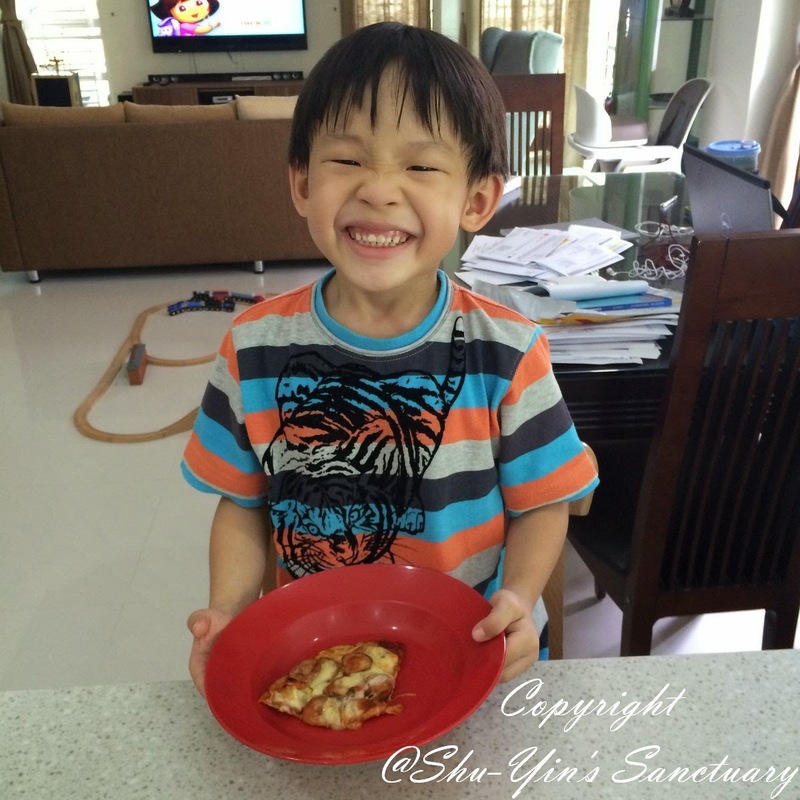 Shern had fun sprinkling the cheese on top. And then lastly, popped it into the oven at 180 dC for about 10 mins or until the cheese are all melted. And tada....your pizza is ready. Erm, look at how we were too generous with the cheese and the sauce so it melted all over the sides. lol. That made my day. And he didn't even noticed the brocolli in the pizza. Look at his happy grinny face. Time for you to make one with your child! I love generous toppings on my pizza too! What a genius idea using those paratha as the base. So simple. I might try this one with my daycare kids next time!